› Author AffiliationsFinancial support from the University of Camerino is gratefully acknowledged. 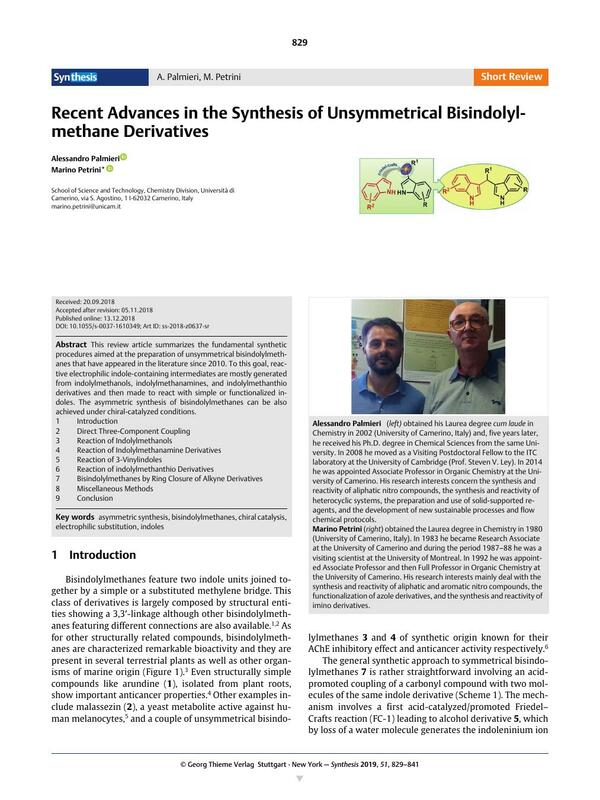 This review article summarizes the fundamental synthetic procedures aimed at the preparation of unsymmetrical bisindolylmethanes that have appeared in the literature since 2010. To this goal, reactive electrophilic indole-containing intermediates are mostly generated from indolylmethanols, indolylmethanamines, and indolylmethanthio derivatives and then made to react with simple or functionalized indoles. The asymmetric synthesis of bisindolylmethanes can be also achieved under chiral-catalyzed conditions.